This page gives an overview of the MicroScale Thermophoresis (MST) method. You can find information on the core technology and typical applications of MST. Also detailed information on labeling and fluorescence requirements and the central advantages of the method are given. For MST Services, please follow the links to the right. MicroScale Thermophoresis (MST Service) is a biophysical technique that measures the strength of interaction (affinity) between two molecules by detecting variations in fluorescence signal as a result of an IR-laser induced temperature change. The range of the variation in the fluorescence signal correlates with the binding of a ligand to the fluorescent target. By that it allows for quantitative analysis of molecular interactions in solution on the microliter scale with high sensitivity. The MST signal is composed of two major factors: The TRIC effect and the thermophoresis. TRIC stands for Temperature-Related Intensity-Change and describes how the fluorescence intensity of a fluorophore depends on the local temperature of the solution. For the vast majority of fluorophores, the fluorescence intensity decreases with increasing temperature. Most importantly, however, the extent of the temperature dependence is strongly related to the chemical environment of the fluorophore. This environment is sensitively affected by the binding of a ligand molecule to the fluorescently labeled target molecule. The second component of the MST-signal, the thermophoresis describes the movement of molecules along temperature gradients which results in a quantifiable change of the local concentration of the target molecules. As these target molecules are fluorescently labeled in MST, such concentration changes can be monitored simply by fluorescence measurements. This directed movement of molecules depends on their molecular size, charge, and hydration shell. Binding of a ligand to a target molecule leads to the change of at least one of these parameters and therefore to an altered thermophoretic movement of the target-ligand complex compared to the single molecules alone. In sum, both TRIC and thermophoresis contribute to the overall MST-signal, which is detected by fluorescence measurement. Due to this robust physical principle and direct monitoring, MST can be used for determining the affinity and binding strength of almost any kind of molecular interaction or modification of small molecules, proteins, peptides, DNA, sugars, or molecular complexes. MicroScale Thermophoresis (MST Services) is based on the combined effect of temperature-related intensity-change of fluorescent molecules (TRIC) and their movement along temperature gradients (thermophoresis). Both the TRIC and the thermophoresis component of the MST-signal vary with three key parameters that are influenced by binding between the fluorescent target and the non-fluorescent ligand molecule: molecular size, molecular charge, as well as the hydration shell of the target molecule. The figure above gives an overview of the technical setup of MST. (A) An infrared laser is used to generate a precise temperature gradient while an LED is used for the excitation of fluorescent molecules inside the glass capillary. The glass capillaries contain a mix of fluorescent binding partner and non-fluorescent binding partner, which is titrated in a dilution series. (B) A typical MST trace is shown: the sample fluorescence in one capillary is measured over time. After five seconds, the infrared laser is switched on, and the sample is heated (MST-on time). The Fnorm value is calculated from the ratio between the fluorescence after heating (F1) and before heating (F0). (C) MST traces are recorded in multiple capillaries containing constant amounts of fluorescent binding partner but varying amounts of non-fluorescent binding partner. (D) The calculated Fnorm from the MST traces is dose dependent and can be well described by the law of mass action. The fit returns the dissociation constant KD of the interaction. MST allows for the monitoring of either fluorescently-labeled molecules or intrinsically fluorescent molecule (such as proteins; the latter would be a truly label-free measurement). MST measurements are possible in any kind of buffers, even in serum, plasma, cell lysate, urine, mucus, or other environmental matrices. Data generation is fast and precise and the data output is comparable to other biophysical methods. For more information, please visit our Application Database. The different service areas can be found under MST Services. MicroScale Thermophoresis (MST) relies on measuring the fluorescence of the studied molecules. Thus, one of the binding partners has to be fluorescent. Intrinsically fluorescent proteins can be analyzed without the need for further fluorescent labeling. Depending on which MST Service you require, different fluorescent methods and/or labelings are possible. Alternatively, molecules with no intrinsic fluorescence can be labeled with fluorophores. Most commonly, the labels listed in the table below are used. 2bind performs the labeling of your target protein for you with all possible dyes. Another option is to fuse a potential target protein with an intrinsically fluorescent protein fluorophore such as GFP, RFP or the like. In the case of DNA or RNA target molecules direct covalent linkage of fluorophores (e.g. Cy5) has proven well. The following table gives an overview over the most commonly used fluorophores in MST. Please keep in mind that, in principle, every fluorophore can be used as long as its excitation and emission wavelength ranges match the ones of the fluorophores listed here. Due to tryptophan residues in their amino acid sequence, proteins can be intrinsically fluorescent. 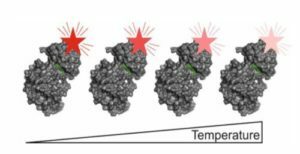 The intrinsic fluorescence of such proteins can be used to monitor their thermophoretic movement. By that no interaction partner has to be modified and the MicroScale Thermophoresis (MST) assay is truly label-free. Such label-free MST is often interesting for specific protein MST services, whose intrinsic fluorescence can be used as an alternatively to a fluorescent label. In order to avoid background noise, it is important that only one binding partner is fluorescent in the tryptophan range. MicroScale Thermophoresis (MST) offers a number of great advantages over other biophysical methods for determining the affinity of a molecular interaction. Follow this link for an overview over our possible services. For a comparison of MST with other biophysical techniques, please refer to our Technology Comparison Guide. What kinds of molecular interactions can I measure? You can measure bi-molecular interactions between any kind of molecule: protein, RNA, DNA, small molecule compounds, lipids, carbohydrates. Is it possible to analyze interactions with aptamers? Yes. Analyzing molecular interactions involving aptamers or other DNA- or RNA-molecules is no problem. Usually, MST measurements with aptamers are straight-forwards, because these DNA molecules can be synthesized directly with fluorescent labels at their 5′ or 3′ end. Most commonly, Cy5 or Alexa647 are used as aptamer or DNA fluorophores. More information on this topic is available in our Aptamer Services. What information do I get from an MST measurement? MicroScale Thermophoresis (MST) is not only able to determine the affinity and binding strength of a molecular interaction, but also allows for assessing other physical parameters such as stoichiometry, aggregation, precipitation, enthalpy (van’t Hoff plot), slow enzyme kinetics, and oligomerization. For specialized kinetics measurements, consider Biolayer Interferometry. If you are interested in the thermodynamics of a molecular interaction, Isothermal Titration Calorimetry is an option. For an in-depth analysis of protein aggregation, protein stability and protein unfolding, take a look at the nanoDSF technique. What type of fluorescent dyes can I use? Our MST instruments detect blue, red, and green fluorescent dyes. We can measure GFP and RFP labeled proteins as well as substrates with a wide variety of chemically attached fluorophores. Please see above (“Compatible Fluorescent Dyes”) for more information on the specific dyes that can be used. Is it possible to measure without labelling a molecule? Yes, 2bind also offers analyzing the affinity of a molecular interaction without labeling of the molecules. The label-free MST system measures best in pure samples and is exceptionally sensitive. In addition to tryptophan fluorescence, it can also work with any other molecule that shows a fluorescence in the range of 280 nm (ex) and 360 nm (em). Can I measure binding kinetics with MicroScale Thermophoresis? MicroScale Thermophoresis measures equilibrium binding constants (steady-state affinity). Typically, samples are inserted in the instrument after the binding reaction reaches chemical equilibrium. Measurement of kinetics is possible if the equilibrium is not reached quickly. On average, the kinetics of reactions that take more than 20 minutes can be evaluated. An in-depth kinetics analysis of molecular interactions is possible with Biolayer Interferometry. Can I measure thermodynamics with MicroScale Thermophoresis? MicroScale Thermophoresis measures equilibrium binding constants (steady-state affinity) at a given temperature. By performing such experiments at different temperatures, the binding enthalpy can be derived from van’t Hoff analysis. An in-depth thermodynamics analysis of a molecular interaction is possible with Isothermal Titration Calorimetry. Can I check for the quality of my samples? Yes! Direct intrinsic quality controls available in the MST setup allow for detecting protein aggregation as well as adhesion and sticking effects of the assay samples to the glass capillaries. An in-depth analysis of the stability and aggregation behavior of your protein samples can be done with nanoDSF. Is it possible to measure the binding of small molecules? Yes, we are able to measure molecular interactions involving small molecules with the same high sensitivity and quality as for protein-protein, protein-DNA or protein-vesicle interactions. For more information on MicroScale Thermophoresis and small molecule please have a look at our Drug Discovery Services. What are the required concentrations for small molecules? Dependent on the fluorophore (fluorescent label or intrinsic tryptophan fluorescence), between 1 – 100 nM of the labeled target molecule can be used. This target is titrated with the unlabeled small molecule compound in the range of ± factor 10 of the expected affinity (dissociation constant). For standard applications, 6 – 10 µl of sample material are used per data-point. My protein is only stable at high ionic strength. Can I still test for binding with MST? Yes, in general it is possible to work with the ionic strength that is best suited for your molecules. Most of the time, a buffer change is not required. For example, we have already successfully measured molecular interactions in a solution with a sodium chloride concentration of 1.5 M.
If you are not sure whether your sample protein really requires high ionic strength buffers, it is possible to investigate protein stability, thermal unfolding, and its aggregation behavior using nanoDSF. We offer a variety of Services in this respect. I want to measure binding to a Mega-Dalton (MDa) molecule. Is this possible? Yes! We have measured protein binding to the 70S ribosome unit as well as the binding affinity to liposomes with a size of more than 100 nm. Are there any limitations to the buffers or additives I can use? No. You can use practically any buffer and any additive as long as it does not negatively affect the stability or homogeneity of your sample. Additives that affect the viscosity of the sample solution should be kept at a constant concentration. A great way to check the tolerance of your protein samples for a vast number of additives is nanoDSF, a method that analyzes the thermal stability and unfolding of proteins. This technique can be used for buffer and additive screenings. Can I measure in biological liquids like serum or lysates? Yes. We are able to analyze the affinity of a molecular interaction also in complex biological liquids like crude cell extract, serum, plasma, urine, sea water, etc. You don’t have to pass on sensitivity or precision when analyzing these types of samples. If you are interested in the stabilty of your protein sample, this can be determined using our nanoDSF technology.